This is the first point on the actual list. It’s really easy to say “so what, some pastors don’t get what preaching really is,” and you’d be right in saying so. But lets go deeper. Let’s say that this is the case and a worship leader in your church doesn’t know what worship really is. Are you going to write them off? Or are you going to disciple them? Think of Aquila and Priscilla in Acts 18. They didn’t stop Apollos from preaching, they disicipled him so that he would have a fuller understanding of the gospel. I’ve met worship leaders who don’t get what worship is. 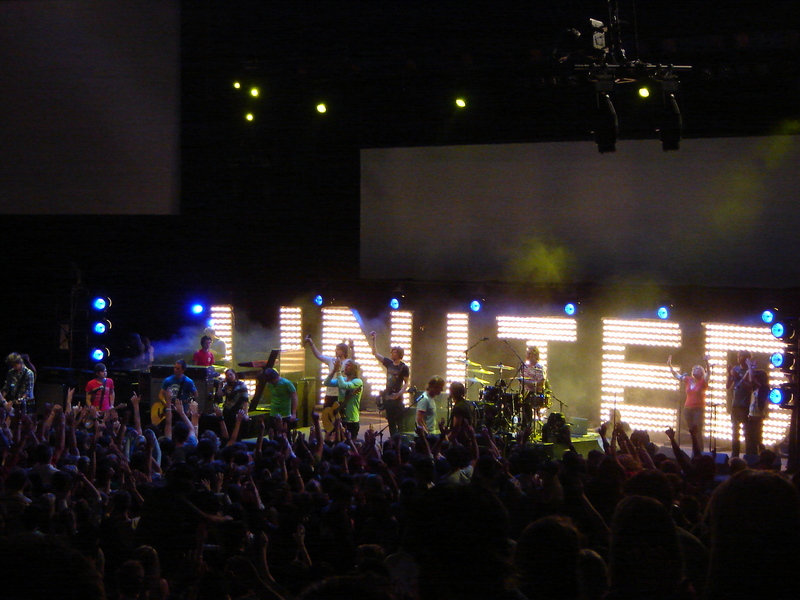 I’ve met worship leaders who have been woefully undisicipled. But that doesn’t mean we write the position of worship leader off all together. I’ve met pastors and elders who aren’t saved, let alone get what church and the gospel are all about, yet I don’t want to see that position abolished either. Yup. Some do. I do in fact. I have an agenda, although I prefer to call it vision or goals. But what the blog post is really talking about are worship leaders who are using the church as a stepping stone to being the next Chris Tomlin or Paul Baloche. That may be true, but it’s been my experiance that most worship leaders, in most churches (who are the folks I write this blog for) are just people who are faithfully serving their local church as best they can, and any Rock Star aspirations we may have once had died a long time ago. For my money, I think the problem he is discribing is far more rapant in the pulpit then in the Worship Ministry. That being said, Paul wrote to Timothy that people would use his youth as a reason to critizise him and that he shouldn’t give those people the oppurtunity. If we continute to serve rather than be served then be served then we will give critics no room for accusations. If we love our church and serve them faithful, there will be no place given for this accusation in our ministries. This critisicsm is nothing new. People have been making this point for hundreds of years. Before lighting rigs and PA systems it was church organs and choirs. The logical fallicy is that “because something is new it must therefore also be bad” needs to die and die now! But let’s take this charge against us and see what we can learn. Are you forcing it? If you feel like the people aren’t engaged to you start to yell and conjoule folks to “c’mon” or “lets go” or whatever words you use? I’ve admittedly always been very uncomfortable with the music in the background while someone preaches the gospel. I think we’ve all see worship leaders and music ministries try to force or create something that is not there. Let’s not let that be what’s said of us. Now, on the otherside. If you think that having the lights and sound done well is an ‘artificial experiance’ then I’m not sure what to tell. So is having the church at a comfortable room temperature. So what are you gonna do? I have a problem with this too, but its a problem in many different parts of the church, and the music is just an obvious expression. But there is a differene between following a fad and being in your context. When you try to follow the fads you’ll always be left behind. The newest thing won’t be new by the time you fully impliment it, and once you do you’ll have to reinvent the wheel again when the new trend starts. It’s a waste of time, energy and resources. This concern is probably where I have the most agreement with critics of modern worship leaders. I do the music that comes naturally to me, and I change my stylistic expression only as it applies to the cultural context I minister in. If you’re church is still in a past cultural context, whether that be the 1950’s or the 1850’s, anyone who’s context and expression is relatively current will look like they’ve sold out or gone trendy, instead of what it really is. This point is in the Reforming Baptists closing paragraph instead of his list, but it’s point I’ve heard made many times before . I’ve been told by pastors I’ve served under before that they are ultimately the worship leader. I’ve even had a pastor tell me what keys to play my songs in (nevermind that my voice couldn’t sing that high or low). So fine, lets say Leadership is ultimately supposed to be the worship leader, let’s think that through fully. Looking at it from the Leadership side: As a Pastor, I have natural authority and responsiblity. Let’s say I’m in charage of a Sunday Morning service, so in a sense, I’m ultitmately responsible for what happens. But that’s not a effective way to lead or manage. I take Jethro’s advice to Moses in Exodus 18 very seriously. It’s not good for anyone if the Leadership is micromanaging. We have children’s ministry leaders, and facilites leaders and Audio/Visual leaders and people charged with praying and yes, people charged with leading the church in song worship. So while the Leadership should be the ones setting overall vision and having ultimate responsibility, they aren’t the ones leading the songs, and it’s a bad system when we try to act otherwise. Looking at it from the Worship Leader side: As a worship leader, I’ve always tried to catch the vision for the church’s overall ministry and the music ministry specifically from the Leadership. At the last church I served at I had a very simple mandate: “Make it good and keep it younger”; that was it. I submitted to that charge from leadership, and if they had an issue we’d talk it through and course correct if nessesary. I think that this set up is probably true for most worship leaders. We may not be in the Leadership ourselves but we serve under them, stand along side, and work with them to accomplish the goal of facilitating a time of song worship for our local church. Like I said at the beginning, I’m not ripping on another blogger. If anything, I appriecate how the Reformed Baptist blog stated common criticisms of what we do in a way that is clearer than most critics. -Make sure that we aren’t conducting ourselves in a way that would give an oppurtunity for such criticsim. Iron sharpens Iron, and I feel that by reading blogs from other points of view and thinking through their critique, I and my worship leading are the better for it.